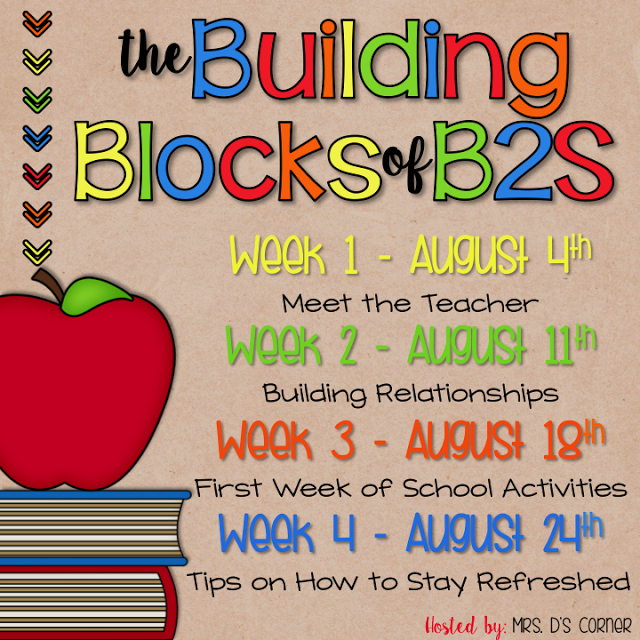 Welcome to Week 4 of the Building Blocks of B2S! Hard to believe we are wrapping it all up now, but this week we are talking all about how to stay refreshed. Ya know, teacher self care. Today is my first day of school with students, which officially marks the end of summer vacation. Iy! Well here’s to another amazing year at a school that I love with students who make my heart feel full. Back to school does mean managing many different aspects of life that, not always, go smoothly when put all-together. I know that more than once during last school year, I felt very overwhelmed and needed to refresh myself to get back in the game. Self care is so important as an educator. Not only does it help you stay refreshed, but it helps prevent burnout. And teacher self care looks so different to every educator. What works for one teacher, may not always work with the teacher down the hall. But that’s okay! You’ve got to find the self care activities that work best for you. This is the most important tip I am going to share: if you feel overwhelmed, take time for you. I know this is easier said than done and may sound super cliche, but it’s true. Take time for you, even if it’s just 15 minutes a day. Do nothing. No phone, no TV, no social media, no anything. Sit and stare at the wall in silence if that’s what it takes. You’ll be surprised what just 15 minutes a day of doing absolutely nothing will do for your mental and physical health. Value your time. Only sign up and sign on for things that are worthy of your time. Your time is precious, just as anyone else’s time is. This tip goes along with Tip #4. Get a handle on your schedule. This is one thing that stresses me out the most is when I have a lot to do and I feel like I don’t have enough time to accomplish all of the items on my to do list. Look at your schedule and see what takes up most of your time and how much of it. If there is a way for your to prioritize your schedule and your to do list? Do it! Here is a freebie to help you out. Learn to ignore some things… pick your battles. That means using your time for the things that are worth it. As a teacher, I sometimes feel like I always need to say “yes” to helping out or planning just one more thing. But, most of the time, it stretches my life and ends up being something I stress over. So learn to say “no” and mean it. Take mini breaks. If you feel overwhelmed during the week, take the weekend off. Go out for dinner with your family Friday night, go see a movie on Saturday, and chill on Sunday after church. It’s okay to take a break when you need it. Your mind and body will thank you! And take big breaks. At least once every 6 months or so I mentally need to take a break from something, usually TpT. My family comes first and I don’t ever want to sacrifice my time and energy spent with them. The first time I *needed* to take a break was two winter’s ago. I was feeling very overwhelmed and seriously needed a break. At first, I felt guilty taking a break from something that I had spent so much time on (TpT). But I knew that I needed it, and with the support of my husband, I took a much needed break for an entire month. It was an absolute refresher that I needed to invigorate myself, my teaching, and my business. So take the time for you and always do what is best for you! What tips do you have for teacher self care and staying refreshed throughout the school year? Tell us in the comments below!